York is an ancient cathedral city at the confluence of the River Ouse and the River Fosse in the broad plain of what is known as the Vale of York. Famous for its Roman Walls and medieval streets (including the narrow "Shambles"), the city of York is the home to the Jorvik Viking Museum (celebrating the city's period as the Viking capital of England) and the National Railway Museum (which includes some of the country's most famous steam locomotives). Perhaps York's most celebrated attraction, however, is York Minster - one of Britain's finest cathedrals and a splendid example of ecclesiastical gothic architechture. 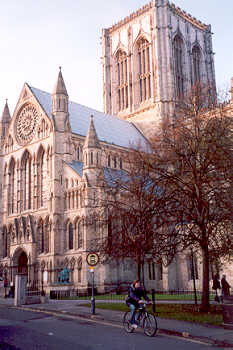 As a city which is a tourist destination in its own right, York makes an excellent base from which to tour the nearby countryside of the Yorkshire Dales, West Yorkshire's Bronte Country, as well as the North York Moors, the Yorkshire Wolds and the Yorkshire Coast (including the seaside resorts of Whitby, Scarborough, Bridlington and Filey).